Britain’s biggest bus and coach operators today (15 September 2009) warned the Government that it risks missing key carbon reduction targets by failing to maximise the potential of buses and coaches to help tackle climate change. The UK’s major public transport groups joined forces to unveil a blueprint to meet the challenge of climate change by taking one billion car journeys off the country’s roads. A YouGov poll for FirstGroup and Greener Journeys found that using public transport more often is seen by consumers as one of the main things they can do to help the environment second only to recycling. 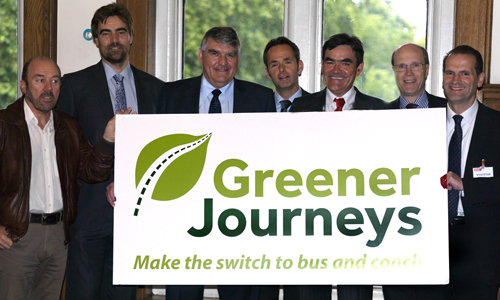 The Greener Journeys campaign launched a manifesto recommending a raft of policy initiatives to encourage modal shift that would deliver 50% more savings in transport CO2 emissions than currently planned under existing Government policies. In an unprecedented joint call for action, bus and coach operators will stress that technological advances alone are not enough to achieve the carbon reductions required to tackle climate change and modal shift must be a key priority. The manifesto, The One Billion Challenge, was launched by senior transport figures, including Sir Moir Lockhead (CEO, First Group), Sir Brian Souter (Chairman, Stagecoach Group) and Professor David Begg (picture). It demonstrates that if people switch from car to bus or coach for just one journey in 25 it would mean one billion fewer car journeys on UK roads over the next three years.